I did not, however, love them. This opinion doesn’t stem from my on-ear prejudice. On the contrary, I found the B&W P5 wireless to be one of the most comfortable headsets I’ve ever worn—but with some unfortunate hiccups also included. These are the same handsome, luxurious headphones as the B&W P5 Series 2, minus a wire and plus $100 on the price tag. Diehard B&W fans that don’t like wires, rich people who do like on-ear headphones, chrome junkies. The P5s are undeniably beautiful. With a supple padded lambskin leather headband and perforated lambskin leather ear pads that hug your head like an old friend wearing a leather jacket, they’re surprisingly comfortable. The headphones are surprisingly light, but the build quality is exceptional and timeless with a shiny aluminum frame and chrome details on either side. The uniquely flat ear cups are also attached to the headset with magnets so they can be replaced or, if need be, plugged in with an included wire. Looks are definitely not the problem. I honestly can’t believe how much I liked wearing these silly things. As someone who prefers to wear sound-blocking earmuffs, the on-ear experience was surprisingly comfortable and inevitably enjoyable. The headphones are engineered to match the performance of the original P5s. This means 40-millimeter drivers with suspended diaphragms, that put out gorgeous high fidelity audio. 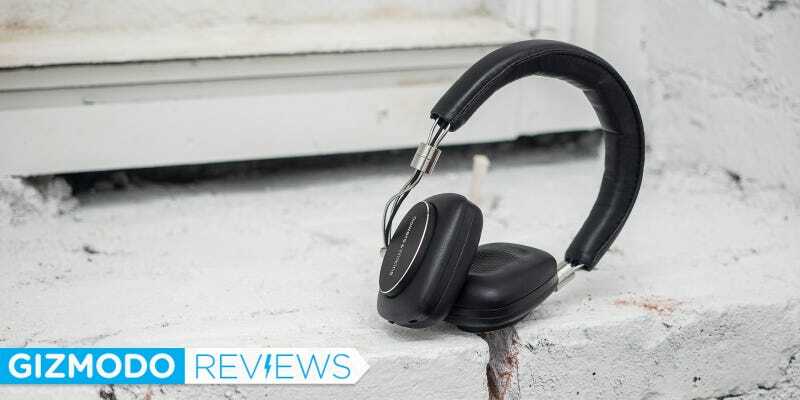 Bowers and Wilkins notes that the headphones are designed to work like full-size hi-fi speakers, with more precise movement and more exacting sound. The grille pattern on the inside of the ear cup also allows air to flow through more easily. All of this amounts to a remarkable level of detail in sound coming out of super compact cans. So far we’re at a 10 out of 10, and then you realize a few Bluetooth shortcomings. Connectivity issue isn’t supposed to be an issue. The P5 wireless cans come with Bluetooth aptX which promises “CD-like quality” over the air. And as advertised, the sound quality is great. But I found myself consistently annoyed by how quickly the headphones disconnect after a few idle minutes. Maybe this is a battery-saving trick (the impressive 17-hour battery life is convenient), but I just hated going into my Bluetooth settings several times a day—especially since the P5s wouldn’t automatically connect like so many other wireless headphones. Beautiful design. Terrific sound quality. Wonderfully comfortable. End of story. I felt like I was constantly re-connecting the headset. While the headphones sounded great without a wire, spending more time in my Bluetooth settings really bummed me out. Did I mention that the P5 wireless headphones cost $400? At that price you could get a pair of Parrot Ziks or four pairs of Jabra Moves, so you should really love these if you’re considering the purchase. That said, if you do have the money to spend, don’t mind the constant Bluetooth connection dance, and want the best sounding on-ear wireless headphones out there, the Bowers & Wilkins are a great choice. But at $400 a pair, this is one gadget that shouldn’t need fixing.